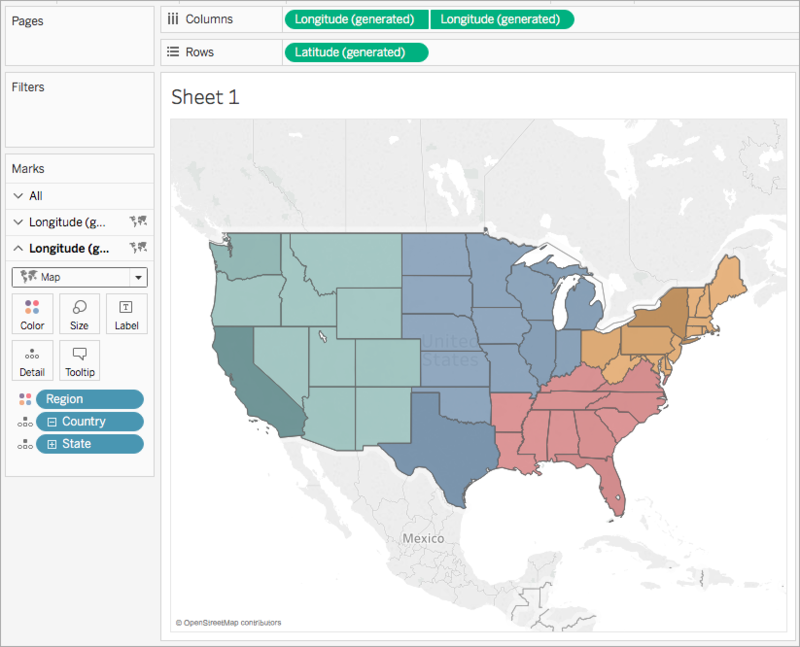 This article introduces user functions and their uses in Tableau. It also demonstrates how to create a user calculation using an example. User functions can be used to create user filters or row-level security filters that affect visualizations published to Tableau Server or Tableau Online, so that only certain people can see your visualization. For example, if you have a visualization that shows the sales performance for each employee in your department published on Tableau Server or Tableau Online, you might want to only allow employees to see their own sales numbers when they access that visualization. In this case, you can use the ISMEMBEROF function to create a field that returns true if the username of the person signed in to the server is a member of a specified group (on the server), such as the "Managers" group, for example. Then when you filter the view using this calculated field, only a person who is part of that group can see the data. Note: If your group or user names contain non-alphanumeric characters, you must use HTML URL Encoding for the special characters when using the functions below. For example, the function ISMEMBEROF("USERS+") needs to be written as ISMEMBEROF("USERS%2B"), because the '%2B' is the HTML URL Encoding for the '+' symbol. For information on HTML URL encoding, please see HTML URL Encoding Reference at the W3schools Web Developer site. User calculations work directly with the users and groups you have set up on Tableau Server or Tableau Online. You can create user calculations to use as filters so users only see the data that is relevant to them. 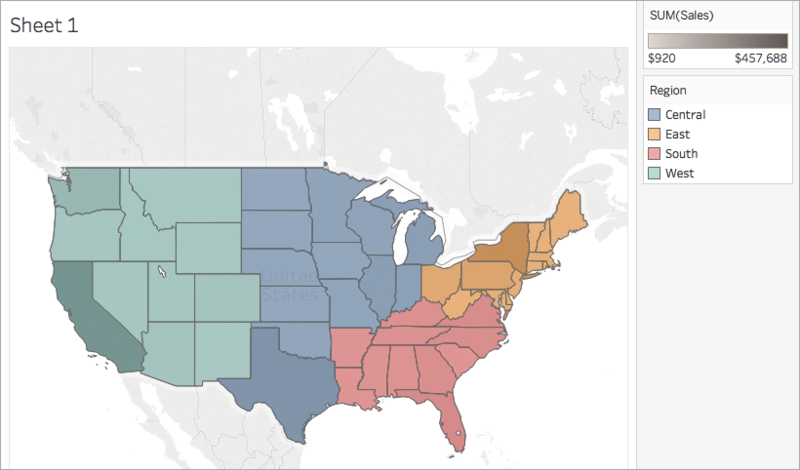 For example, if you have a map viz similar to the following, which shows sales data for 48 US states, you can create a user calculation to show only parts of the map that are relevant to each user, such as data relevant for a regional manager versus a national manager. (A national manager should be able to see data for the entire country, while a regional manager should only be able to see data for the region they manage). To create a user function that performs similarly to this example, follow the steps below. 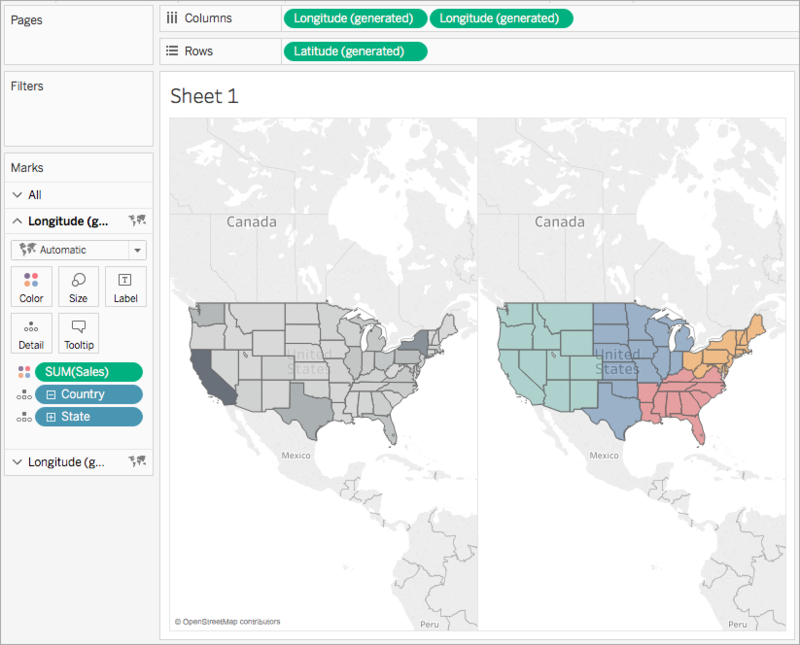 To follow along with this example you must have access to Tableau Server or Online. You must also be a Server or Site Administrator. Sign in to Tableau Server or Tableau Online. For more information, see Add Users to a Site in the Tableau Server Help. Create a new group called National Managers. 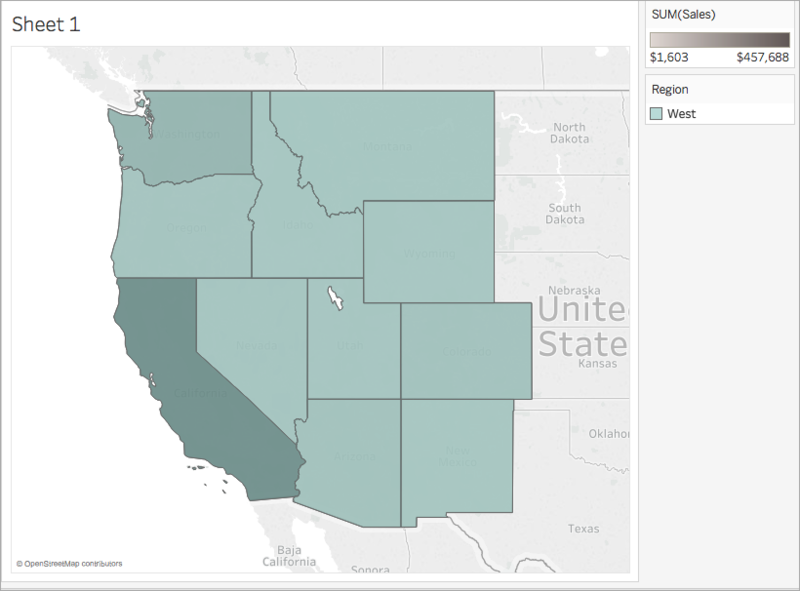 For more information, see Create a Local Group in the Tableau Server Help. Add yourself to the National Managers group. For more information, see Add Users to a Group in the Tableau Server Help. 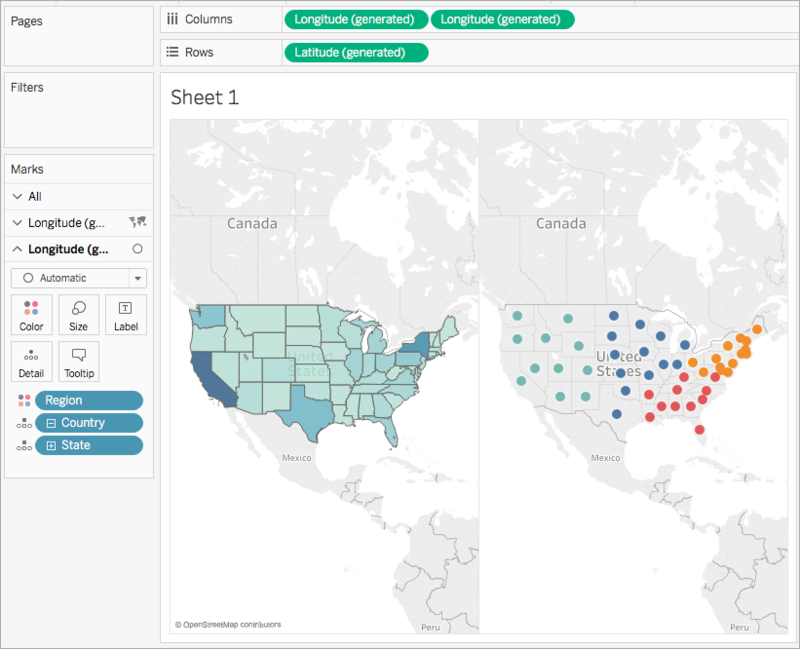 Open Tableau Desktop, and connect to the Sample-Superstore data source, which comes with Tableau. In the bottom left corner of the workspace, click the Data Source tab. On the Data Source page, from the Connections pane on the left, drag the People sheet to the join area. Click the join icon and select Left. On the Columns shelf, select the Longitude field and hold down Control (Comman on Mac) on your keyboard to copy it. Drag the copy to the right of the original on the Columns shelf. On the Marks card, click the second (bottom) Longitude tab. From the Data pane, drag Region to Color on the Marks card. The map view on the right updates with new colors. On the Marks card, click Color, and, under Opacity, adjust the slider to 50%. On the Marks card, click the first Longitude tab. On the Marks card, click Color > Edit Colors, and then select Gray from the color palette drop-down list. 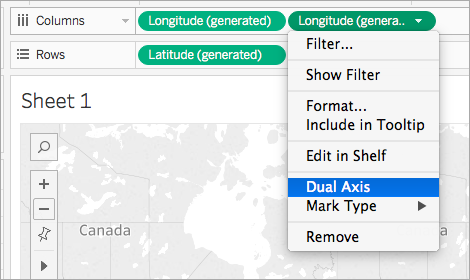 On the Columns shelf, right-click the Longitude field on the right and select Dual Axis. Name the calculated field, User Filter. This calculation checks if a person is included in the Region (People) field, or if a person is included in the National Managers group. If so, it returns true. The new user calculation appears under Dimensions in the Data pane. Just like your other fields, you can use it in one or more visualizations. From the Data pane, under Dimensions, drag User Filter to the Filters shelf. In the Filter dialog box that opens, select True, and then click OK. Note: If you are not signed in to Tableau Server or Tableau Online, the True option is not visible. In Tableau Desktop, sign in to Tableau Server or Tableau Online to select it. See Sign in to Tableau Server or Online for more information. In Tableau Desktop, in the bottom-right corner of the workspace, click the Filter as User drop-down and change the user to Anna Andreadi. The map updates to show only the West region of the United States because Anna is assigned to the West region in the People sheet. Select the Filter as User drop-down again and change the user to Kelly Williams. The map updates to show only the Central region of the United States because Kelly is assigned to the Central region in the People sheet. Select the Filter as User drop-down again and change the user to Chuck Magee. The map updates to show only the East region of the United States because Chuck is assigned to the East region in the People sheet. Select the Filter as User drop-down again and change the user to Cassandra Brandow. The map updates to show only the South region of the United States because Cassandra is assigned to the South region in the People sheet. Select the Filter as User drop-down one more time and change the user back to yourself. The map updates to show all data because you are a part of the National Managers group on the server. This behavior persists when you publish the view to Tableau Server or Tableau Online. Users not listed in the National Managers group, or in the People sheet in the Sample Superstore data source see only a blank visualization.